Editor's Note: UTSA President Taylor Eighmy sent this email to UTSA faculty, staff and students updating them on the investigations into Monday's classroom incident. I am writing with an update and final outcomes of our investigations into Monday’s classroom incident. I have received briefings on the final reports for both investigations which are summarized below. In the spirit of full transparency, and given the national attention that this incident has drawn to UTSA, I want everyone to be very clear regarding the facts and outcomes. I requested an investigation of Monday’s incident by our EOS office to determine if factors of discrimination were involved. FERPA regulations prevent me from sharing the report, but I am able to share this summary from the briefing I received. EOS conducted in-depth interviews with both the faculty member and the student, as well as an examination of social media posts and information submitted by email. EOS’s assessment, based primarily on the opinion of the student, is that racial bias was not a factor in the actions of the faculty member. Because the student feels the faculty member’s actions were not based in racial bias, she has elected not to file a formal complaint of discrimination with EOS regarding the incident. Interim Dean Grimes’s final report contains a full synopsis of the events leading up to Monday’s incident. This was compiled based on interviews with both the faculty member and student, as well as many students currently enrolled in the faculty member’s classes. Dr. Grimes’s investigation also included a thorough review of the faculty member’s teaching evaluations and consideration of supportive student testimonials received via phone and email. The instructor has a very strong track record of positive student evaluations, and she had no prior incidents of classroom mismanagement. Moreover, the students interviewed shared their opinions that the faculty member’s actions did not warrant her dismissal. Based on all this information, Dr. Grimes has concluded that the faculty member failed to manage her classroom and displayed poor judgment in her handling of Monday’s situation, but that her actions do not warrant termination. As noted in my last update, the faculty member was relieved of her duties as an instructor for the remainder of the semester. She will be required to undergo classroom management training with UTSA Teaching and Learning Services, at which point she will be allowed to return to teaching for the Spring 2019 semester with ongoing monitoring. Provost Espy has accepted Dr. Grimes’s report and outlined the support and protections UTSA is providing to the student. Dr. Grimes is working with her to ensure her academics are not impacted, and she is also receiving personal support and counsel through our Dean of Students office. I was grateful for the opportunity to have met with the student and her family today and have extended my apologies on behalf of UTSA. Let me reiterate that the results of these investigations in no way diminish my firm commitment to the work we must do to create a more inclusive campus environment. After hearing from so many students, faculty and staff regarding their feelings of marginalization, disrespect and fear, I am more convinced than ever that this is a top priority for UTSA. We will move forward with all the action steps I listed in my last update. In addition, Provost Espy will soon send a follow-up to update the community on some of the activities we’ve already begun to increase faculty diversity at UTSA – a key component of creating an environment welcoming to all students. This work is urgent and must be an ongoing effort. I know UTSA can be a national model for campus inclusivity, and I am committed to providing the resources, time and attention needed to reach that goal. Connect with UTSA online at Facebook, Twitter, YouTube, Instagram and LinkedIn. 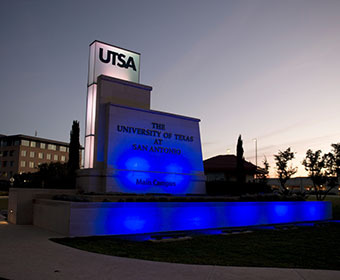 UTSA Today is produced by University Communications and Marketing, the official news source of The University of Texas at San Antonio. Send your feedback to news@utsa.edu. Keep up-to-date on UTSA news by visiting UTSA Today. Connect with UTSA online at Facebook, Twitter, Youtube and Instagram. The events are a collaborative effort between student organizations, student led-groups, and campus departments. The UTSA and San Antonio communities are invited to see the Roadrunners in action during this free game that marks the end of the spring workouts season. Saturday, April 20, 5:00 p.m. The UTSA Alumni Association and the San Antonio Parks Foundation will co-host the official Fiesta event. The outdoor event is family-friendly, with live music, lawn games, a free mechanical bull ride, photo fun, local food, fresh sips, local art and cowboy merch. Admission is free for those who RSVP online, however there will be a $10 entry charge at the gates on the day of the event, as capacity allows. UTSA is a designated early voting site for the May 4 Joint, General and Special Election. Any registered Bexar County voter can skip the lines and cast a ballot at UTSA from Monday, April 22 to Tuesday, April 30. Wednesday, April 24, 1:30 p.m. The Campus Master Plan task force and Page consultants will share the initial draft of the master plan. Wednesday, April 24, 3:30 p.m. The Campus Master Plan task force and Page consultants will hold a series of meetings in late April and early May to share the initial draft of the master plan. Tuesday, April 30, 6:00 p.m. In this UTSA 50th anniversary speaker series, Roger Enriquez, UTSA associate professor of criminal justice, explores how immigration past and present helps us understand its future. Monday, May 6, 6:00 p.m. Grab a friend and sign up to bowl with fellow Roadrunners and raise money for scholarships. The University of Texas at San Antonio is dedicated to the advancement of knowledge through research and discovery, teaching and learning, community engagement and public service. As an institution of access and excellence, UTSA embraces multicultural traditions and serves as a center for intellectual and creative resources as well as a catalyst for socioeconomic development and the commercialization of intellectual property - for Texas, the nation and the world. To be a premier public research university, providing access to educational excellence and preparing citizen leaders for the global environment. We encourage an environment of dialogue and discovery, where integrity, excellence, inclusiveness, respect, collaboration and innovation are fostered.